HAIFA, ISRAEL (February 5, 2019) – When human tissue is damaged by trauma or disease, replacement tissue is needed by surgeons to repair it. The tissue is usually transplanted from one part of the patient’s body to another (autograft) or from one person to another (allograft). Autografts can save lives, but they are complicated: Harvesting autografts is painful and costly, and infections and hematoma (solid swelling of clotted blood) within the tissues can result. Transplanted tissue via allograft is also complex because the recipient’s immune system can reject the tissue, and the graft can transport infection or disease to the recipient. The field of tissue engineering aims to regenerate or replace damaged tissues using tissues made in the lab. Cells taken from the body are incorporated with very porous scaffold biomaterials, which act as 3D templates that guide the growth of new tissue. 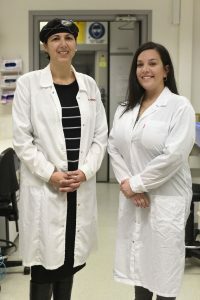 A doctoral student in biomedical engineering at the Technion-Israel Institute of Technology in Haifa and her colleagues have brought successful tissue engineering a step closer. Shahar Ben-Shaul – working with Shira Landau and Uri Merdler under the supervision of Prof. Shulamit Levenberg – have just published their findings in an article called “Mature vessel networks within engineered tissue promote graft-host anastomosis and prevent graft thrombosis” in the latest issue of PNAS (Proceedings of the US National Academy of Sciences. 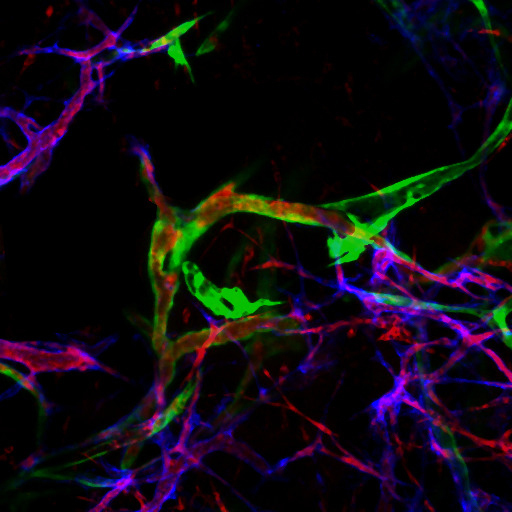 Blood perfusion (red) of the implanted engineered- vessels (green) connected to the host blood vessels (blue). The scaffolds are seeded with cells grown in vitro to create tissues for implantation or are introduced directly into the exact site where the patient’s body has been damaged or diseased. The tissues are then coaxed into regeneration. Graft vascularization – creating blood vessels to bring oxygen and nutrients to the regenerated tissue, is one of the most difficult tasks before this process can succeed in creating thick, transplantable tissues and organs. In-vitro ‘pre-vascularization’ of engineered-tissues has been suggested to promote rapid “anastomosis” (connection of blood vessels) between the graft and the recipient’s tissues. But thrombosis (clotting or coagulation) in the grafts can result. Ben-Shaul and her team aimed at finding out whether transplanting more mature engineered vessels to integrate with the patient’s tissues could speed up this process without causing thrombosis in the grafts. They cultured endothelial cells and fibroblasts on 3-dimensional scaffolds for 1, 7 or 14 days, to form vessels of different ages. The result was that the most mature grafts with complex vessel networks that have grown longer in the lab increased graft-host vessel anastomosis and improved penetration of the vessels in the recipient. The less-mature vessels were less successful in combining with the host tissue and caused more clots to be formed. These findings, they wrote, “demonstrate the importance of establishing mature and complex vessel networks in engineered-tissues before implantation” in promoting anastomosis with the host and speeding up the perfusion of blood into the tissues. After the current study in the mice, Ben-Shaul hopes to conduct additional preclinical studies that could lead to the implementation of the study’s conclusions in humans.